We just wrote about Twitter’s second deal from the new sales initiative, a TV. The new deal offers a 32-inch Vizio HDTV for $349.99 at Target, along with free shipping. 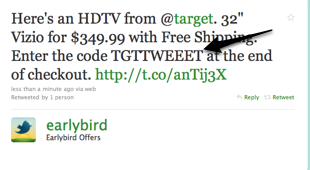 But, it appears that the promotion code “TGTTWEEET,” which user needs to enter in the last stage of the checkout process to receive the deal, is incorrect. I actually tried to purchase the TV twice with the code and was told by Target that the promotion code was invalid. Twitter Tweeted ten minutes ago (several hours after the deal was announced), saying that the code had an extra ‘e’ in it. As we wrote in our last post, the deal itself was fairly underwhelming. The TV is listed on Target as $388 (the original list price is $450), so you’ll get a little less than $40 discount plus free shipping. On Amazon the TV is listed for $405 but Walmart has the same TV for only $358, which is just $10 more than the discount. Sam’s Club has the same TV for exactly $348. Of course the Twitter-sponsored deal includes free shipping but it certainly doesn’t make the deal a big winner. Unfortunately, Twitter’s Earlybird deals have not been that impressive, even with all the hype about the service. Last week’s two-for-one deal for movie tickets for “The Sorcerer’s Apprentice,” also didn’t meet many’s expectation because the film turned out to be a dud.